Want to run the perfect marketing pitch on a small budget? Use brochures; they are the right medium to boost your business, small or large. One of the vital elements of your marketing kit, brochures, when positioned at high-traffic areas help to highlight the features of your products and services in the most effective manner. So, use brochures effectively to drive your product sales. Focused approach: Know the reasons for bringing out your brochure. It is essential for you to be aware of the aim, purpose or objective of the brochure as that will enable you to create a targeted message which will evoke the required response. Simplicity counts: Simplicity is the key to greater readability. Do not go overboard; it is suffice to give just an overview as otherwise readers can get overwhelmed by the information. Harp on benefits: An important aspect of good marketing is to harp on the benefits of your product or service. The customer is more interested in knowing how he will profit by investing in your product or service. Persuasive call for action: Your brochure should evoke a responsive action on the part of the customer. The call to action should be easy to follow and not require efforts on the customer. Informative brochures are the best ways of informing your current and prospective customers about your products and services. Customers can definitely become more knowledgeable as they shift through the information in your brochure and make an intelligent purchase. We, at Ruby Prints have been involved in producing visually appealing and high impact making brochures. 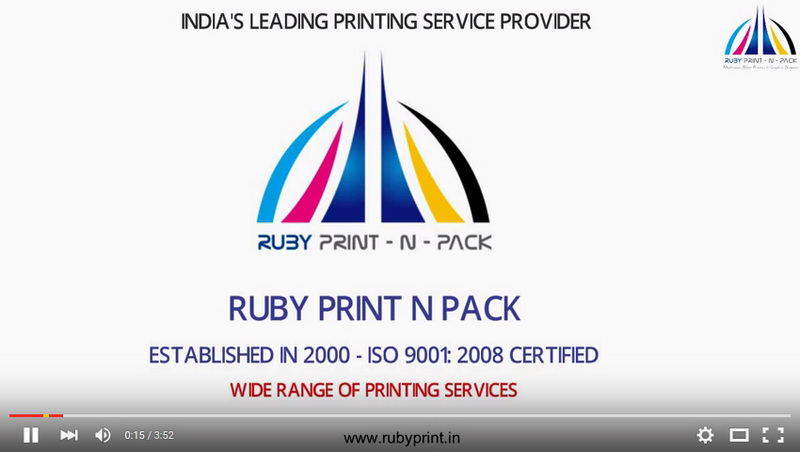 An established name in the online brochure printing services India business, our expert professionals will be with you throughout; right from your first call through the creation to ensure that it is going great at every step. In today's world of intense competition, you need to stand apart from your competitors and raise the curiosity and interest quotient of existing and potential customers. With the backing of our expert team, Ruby Print will get you the perfect solution for your custom brochure design & printing project. We help you in the do-it-yourself route or we get the whole thing designed and printed for you. So, when you think of brochures, think of Ruby Print!